‘Ayn Gharandal lies ca. 70 km north of the Gulf of Aqaba, ca. 40 km SW of Petra, and ca. 200.0 m west of the mouth of Wadi Gharandal on the eastern edge of the Wadi Arabah. The ruins rest alongside the modern paved road running east from the nearby Dead Sea highway. The presence of an artesian spring in the mouth of the wadi presumably served as the reason for human occupation at the site. ‘ Ayn Gharandal and its surroundings were visited by many of the early twentieth century explorers to the region. Alois Musil was the first to record the ruins of a Roman castellum at ‘Ayn Gharandal in 1902. Musil’s description of the site also includes at least two additional structures near the fort, as well as miscellaneous walls, towers, and a basin in the vicinity of the spring. T.E. Lawrence also passed through ‘Ayn Gharandal in 1914 as part of the Palestine (Wilderness of Zin) Survey. ‘Ayn Gharandal has received moderate attention from archaeologists in recent years. The site, however, has not been the primary focus of their work. Rather, it has been included as part of larger regional surveys. While these recent projects have produced important results for the site’s regional context, little new information has emerged about the site and its structures. It has sometimes been claimed that the name “Gharandal” is derived from the ancient name “Arieldela” listed in the Notitia Dignitatum (Or. 34.44) as the location of the Cohors II Galatarum. A similar name also appears in the Beer Sheva Edicts as Ariddela (frag.V, line 5), though this may, in fact, refer to a different site altogether. Until the AGAP 2013 season, a total lack of any evidence from ‘Ayn Gharandal confirming its identification left the ancient name of the place and the unit garrisoned there a matter of scholarly speculation. However, the monumental inscription unearthed during the 2013 season indicates that the site is the location of the Cohors II Galatarum, confirming the ancient identity of ‘Ayn Gharandal as Arieldela. The fort and bathhouse at ‘Ayn Gharandal parallel other Late Roman sites in the region in both design and geographic location, controlling the scarce water resources along an important N-S trade route through the Wadi Arabah. 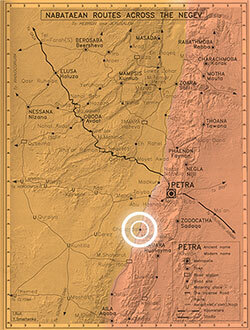 The construction of the road and the numerous military installations along it including, Bersabee, Chermela, Thamara (‘En Hazeva), Zoara, and Arieldela (Gharandal), are attributed in the Onomasticon of Eusebius to the transfer of the Legio X Fretensis from Jerusalem to Aila at the beginning of the fourth century C.E. In a broader historical context, the Roman military presence at ‘Ayn Gharandal during Late Antiquity appears directly related to the reorganization and redeployment of the legions of Arabia and Palaestina to the eastern frontier under Diocletian and the Tetrarchs in ca. 300 C.E.